Club cricket is back in swing down under, and while a number of the Irish players are now in Ireland or Sri Lanka, several are making their presence felt in Australia and New Zealand this weekend. Sean Terry’s Melville side lost a 50 over contest to Wanneroo today. Terry scored 29, the second highest total as his side finished on 168 all out with 3 balls remaining. Wanerroo, who were without Stuart Thompson who returned to Ireland last month, reached their target with 17 balls to spare, for a 6-wicket win. Jacob Mulder had more luck, as his South Perth side beat Midland-Guildford, another side missing a returned NW warrior in Andy McBrine. Mulder wasn’t called upon to bat in the first innings, as his side finished their 50 overs on 266-8, and he took 2-50 in his 9 overs as they won by 35 runs. For once, Nathan Smith went wicketless in a 50 over game, but his Northern Districts side won their 1st Grade game against Sutherland by 5 wickets. Smith went for 0-36 in his 9 overs, which at 4.0 was the most economical of the Northern’s bowlers. Graham Kennedy played a key role in Hannan’s victory in a 50 over game against Greater Boulder. In the first innings, he took 2-36 in his 10 overs (and he caught the Greater Boulder top-scoring batsman), as they limited their opponents to 163-9. In the second, he top-scored, batting at 4, and finished 73*(73), to steer his side to an 8 innings win in 29 overs. Ross Allen had a successful day, despite limited opportunities which he managed to make the most of. His Central’s side played Yallourn North, and the speed with which their opponents were dismissed (40 runs in 13.0 overs) meant he only got to bowl one over. He made it count though, taking 1 wicket for only 2 runs. In the second innings, Centrals knocked off the runs for the loss of only 1 wicket in 6 overs. This at least allowed Allen, batting at 3, another brief cameo which he again made the most of, scoring an unbeaten 10* before Centrals reached their target. The Irish duo at Preston had a slower start to 2019. In the first innings of their 45-over game against Bayswater, Eoghan Delany (4) and Fionn Hand (12) made lower contributions than usual to their side’s total of 165-9, and Bayswater reached their target in the 33rd over, for a 5 wicket win, Hand’s 9 overs going 1-52. Two matches to report regarding Cormac McLoughlin-Gavin’s Lisarow-Ourimbah. A late scorecard from last week shows that in another T20 (they played 2), they beat Southern Spirit by 9 wickets, Cormac top-scoring with an unbeaten 62* of his side’s 132 runs. Today, they started a 2-day game against Brisbane Water. In the first innings, Cormac scored 8 runs as his side were all out for 126 in 61.0 overs. Their opponents finished play today at 59-3 after 29 overs. Diarmuid Burke’s Scarborough had a comfortable win over Joondalup in a u15 T20. They scored 129-3, and Burke took 1-17 in his 3 overs as their opponents were all out for 111. 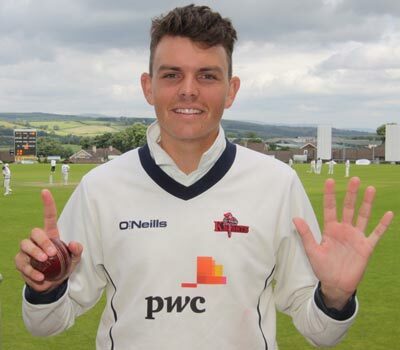 Finally, an update from two of NCU’s young guns from Alan Waite. Jonathan Waite & James Metcalfe took advantage of the Christmas break to go on a road trip the length of both islands in New Zealand. They travelled through Wellington to the South Island taking in Dunedin & Queenstown and spending three days at the Sri Lanka test match in Christchurch. They arrived back in Tauranga in time to attend the two ODI’s and witness first hand the spectacular hitting of Jimmy Neesham and Tilsara Perera. In their first game back on Saturday, Otumoetai bowled out Aquinas for just 99, Metcalfe again excellent behind the stumps. In reply, Otumoetai reached their target for the loss of four wickets with Waite making 48. There was much banter when they got sight of the NCU Premier league fixtures – First up Lisburn v Instonians! Again, thanks for all the information passed on, I can be contacted via twitter (@dotski_w).